Written in a warm and entertaining style, The Arthurian Companion contains over one thousand entries, cross-referenced and annotated. It is an alphabetical guide to the "who's who" of Arthurian legend, a "what's what" of famous Arthurian weapons and artifacts, and a "where's where" of geographical locations appearing in Arthurian literature. An extensive chronology of Arthur's reign is included. 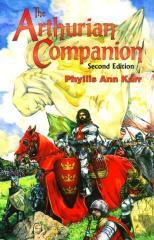 Revised and corrected, this new edition of The Arthurian Companion is a valuable reference for fantasy fans, researchers, and lovers of medieval romance. Arthur was no chessboard king.... he was a good knight in his own right, capable of fighting in the field or tournament, slaying terrific giants, and so on. His men loved him because he would jeopardize his life like any of them, even riding incognito to seek adventure.